B.A., Graduated from FTII's Department of Film Directiion in year 2004 and started teaching at FTII in 2006. While in service, Mr. Meshram has completed his M.F.A. in Drama from Nagpur University. He is currently associated as Dean Film in the Institute. He has completed M.Sc from Pune University in Physics. He joined FTII's Television wing as a faculty in 1983. 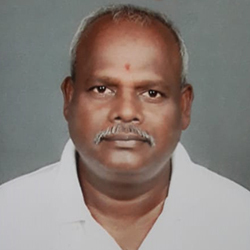 He is currently associated as Dean Television in the Institute. Sandeep Chatterjee is a distinguished alumnus of the Film &Television Institute of India, Pune. He began his teaching career as Assistant Professor at Satyajit Ray Film &Television Institute in Kolkata, from its inception in 1997 and later joined FTII in 2009. He also has taught in various film schools and has conducted workshops and lecture sessions in India and abroad. 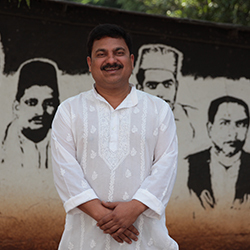 His film “Sundar Jeebon”based on a story by iconic Bengali poet Jibanananda Das, has won the National Award. His other influential films like “Raat Koto Holo”and “Reconnaisance” had also won him critical acclaim. With his experience as filmmaker and as a teacher for more than 25 years, he is currently the Professor and Head of the Department of Direction and Screenwriting. 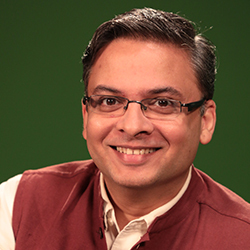 He holds Diploma in Electronics from Cusrow Wadia Institute of Technology, Bachelors Degree in Electronics & Telecommunication (E&Tc) and Masters Degree (ME – E&Tc) from Govt. of Engg. under Pune University. Before joining FTII in 2006 he rendered his services as Service Engineer at Cusrow Wadia Institute of Technology, Technical Assistant at Army Institute of Technology (AIT), Assistant Professor at MIT Women Engineering College (MIT WEC). At FTII, in addition to the post of Professor, he also worked as Liaison Officer, Purchase Officer, OSD (Administration), In-charge Radio FTII, Controller of Examination, Registrar etc. Presently, he is holding additional charge of National Coordinator, Skilling India in Film & Television (SKIFT), an initiative of FTII under which various short courses are being conducted all over India. 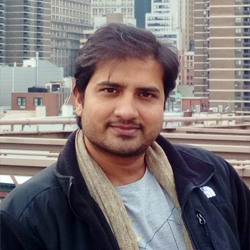 He is a Research Scholar at JJT University, Rajasthan and has published number of National & International papers in the field of Electronics & Telecommunications. He has more than 20 years of experience in the field of professional & academics. Diploma holder from FTIT, Madras. Diploma in Journalism &Mass Communication. M.A &M. Phil (sociology). Served in Doordarshan and Films Division as an Editor. 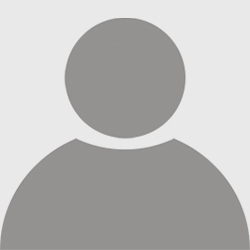 Mr. Singh is an Electrical Engineer from Institute of Engineers, Kolkata. 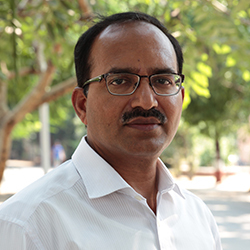 He has done MBA from Indira Gandhi National Open University, MA in Mass Communication from Kurukshetra University, MA English and PhD in Management from Pune University. After working in Doordarshan for more than 6 years, he joined FTII in the year 1990 as the Course Coordinator for TV Engineering. Holds Diploma in Commercial Arts from Kolhapur, Advanced Diploma in Computer Animation from C-DAC Pune, Masters degreein Indology from TMV Pune and Master of Fine Arts from University of Aurangabad. 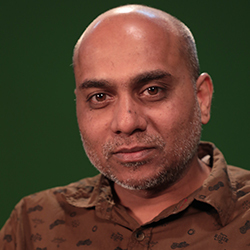 After working in Animation and VFX industry for 14 years he joined FTII in December 2011. 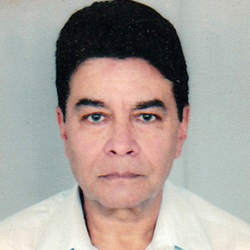 Jijoy P.R. is a theater, film actor, trainer, producer who observed performing art as a tool for scientific temperament and incorporates it through acting workshops mostly in India and in Middle Eastern countries. A graduate in B.A. Economics and in B.T.A (Theater Arts) from Calicut University, Jijoy Secured First Rank in both M.A. And M.Phil (Drama and Theater Arts) from Pondicherry University. As an actor Jijoy has 55 Films, 40 Plays, 10 Serials and 25 Short Films in his credit. He has performed nearly 400 International Theater shows across the 4 continents i. e. Australia, Europe, North America and Asia, along with The Royal Shakespeare company, Act Productions UK, The British Council and The Japan foundation Asia Center. He is recipient of Junior Fellowship from Ministry of Culture and the young artist scholarship from MHRD. He has been teaching at FTII's acting department since year 2014. BSC Maths Physics Statistics from Calicut University and Diploma in Audio Engineering from SAE, Chennai in 2003. Teaching since 2010. 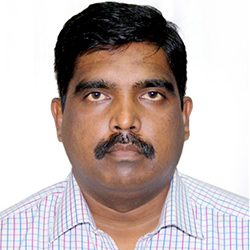 Mr. Jagdeeswaran graduated from FTIT Chennai, in 1985. After working in the Tamil film industry, Doordarshan, West Bengal Film Development Corporation and Film Division he joined in FTII 1993. After teaching Cinematography in Film wing for 10 years, he moved to teaching Electronic Cinematography in TV wing as an Assistant Prof. He completed his Masters in Media Business Management while in service at FTII. Holds BFA in Applied arts from J.J. School of Arts, Mumbai, 1995. Masters in Indology and completed PG Diploma in Art Direction from FTII, batch of 1996. 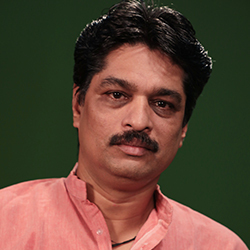 He has teaching and professional experience of20 years at Film and Television Institute of India, Pune. Milind Damle is a FTII alumni with specialization in film and TV editing 2004. He has been practicing Radio, TV, Film in various creative positions such as writer, producer and director. 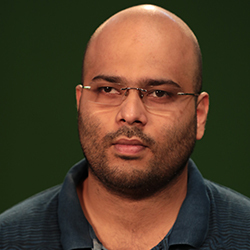 Dwijaa, the Diploma film he wrote and edited won a National Award in 2005. Adwait Sangeet, which was honored as opening film of Indian Panaroma, IFFI 2011 was co-produced by him. He has also worked as Coordinator for UNDP FTII Planning Commission Project “Films for Human Development” producing 32 films in 13 states of India. 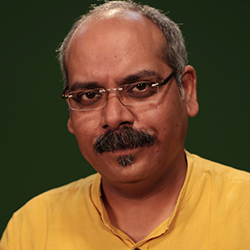 After working with the Star TV as Executive Producer, now he serves FTII as faculty since 2012. 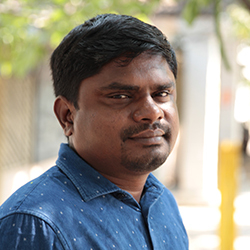 While in service Mr. Damle has completed MA Mass Communication and Journalism from Madurai Kamraj University. 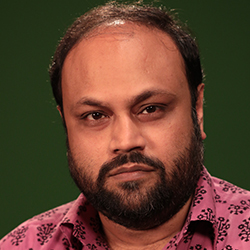 Along with teaching, he also practices Film Editing in Regional Indian Cinema. 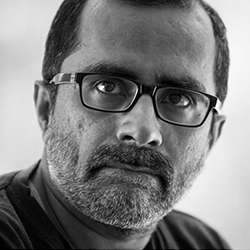 Educated at St.Xavier's College, Kolkata, Amlan Chakraborty, holds degree in B.Sc from the University of Calcutta in (1998) and Post-graduate Diploma in Editingspecialization from FTII in (2002). He has also completed Initiation to Filmmaking programmeat Chitrabani, Kolkata in 1999. As student in FTII, he received "Outstanding Asian Student Film Award" in 2005 at the Student Film and Video Festival organized by the Beijing Film Academy. His area of specialization includes early historical practices in Film editing, Continuity Editing styles of Classical Hollywood Cinema and Post-classical trends in Film &Video Editing. 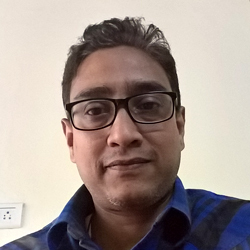 He started teaching in Film &Video Editing since 2010 at Pailan Film &Television institute and later at West Bengal State University, Barasat for M.A. in Film Studies with specialization in Photography, Documentary, and Short Fiction Film. He joined FTII as Assistant Professor in 2014. Studied Sound Recording and Sound Engineering (Honors) from Film and Television Institute of Tamil Nadu (FTIT), Chennai. He has completed more than 40 feature films as a Sound Recordist / Sound Editor / Re-recording Mixer / Sound Designer. He alone designed the 7.1 Digital Surround Sound Studio in the Film Division, Mumbai and 7.1 surround sound 4K VVIP preview theater in the film division Delhi, Govt. of India. Entrusted as a sound designer/Audio Director for creating a surround sound effects library for feature film production and for the independent films makers in Films Division with state-of-the-art international standards. He is Associated as Freelance Quality Control Engineer/Re Recording mixer for Walt Disney and Cartoon Network Productions. He also is recipient of Tamil Film Fare Award for the Best Sound Designer. 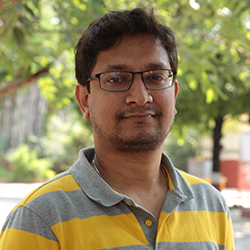 Sumit Kumar graduated from BHU, Varanasi and also completed his Diploma in Film Editing in 2014 from FTII, Pune. His edited documentary “The donkey fair” got selected in Indian Panorama, IFFI- Goa, 2013 and also got special mentioned in 1st National Student Film Award, 2013. His directed and edited short film “Innovative Dream” selected and won best film award in “Porsche Film Award 2015, Stuttgart, Germany. His edited advertisement for EESL won PR Asia awards-2016. His edited feature film “1982 a love marriage” won "Best Romantic Film" award at the 9th Jaipur International Film Festival in India. He edited the campaign “Make Love, not scar” which won prestigious Silver Lions in Creative Effectiveness for Good at Cannes Lions-2017, France. Shri. 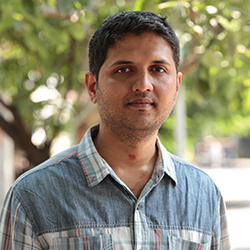 Kumar, worked several years as a lead graphics designer and VFX artist before joining FTII as an Assistant Professor at TV wing, Editing Department in 2017. Schooled at bishop cotton school, Shimla, he did his post graduation from st. Stephen's college in Delhiin English honours, before joining the acting course at FTII in 1972. He has been senior professor of acting at whistling woods international (2006 -2010), and was visiting faculty at fine arts institute in Rohtak, Haryana, and the Satyajit Ray Film and Television Institute (SRFTI) Kolkata, and Film and Television Institute of India, Pune. Benjamin Gilani is presently mentor of the screen acting department in the Institute. BA with Honours in English Lit from University of Delhi, Diploma in Film Editing from FTII in 1982 and PG Diploma in Film Direction from FTII in 1984. After working on various film and TV projects as a scriptwriter and director for about 12 years, he spent several years setting up TV industry in Uganda and Kenya; while also working on TV shows, films and documentaries all along. He joined FTII as Dean (Film) in July 2016. Currently he is associated as Professor, Film Appreciation. Prasann Jain studied painting and pictorial photography at the College of Art and Triveni Kala Sangam, New Delhi under Mr. RameshwerBroota and Shri O.P. Sharma. After participating in several national exhibitions of painting and photography, he joined the Film and Television Institute of India, Pune for the Diploma in Cinema (Motion Picture Photography). He assisted renowned cinematographer and filmmaker Mr. A.K.Bir. 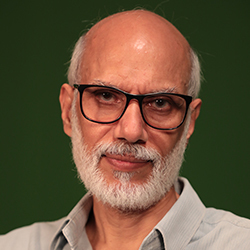 In the career as an independent cinematographer for over two and a half decades he has worked with many established and award-winning filmmakers like Mr. ShyamBenegal, Mr. ArunKhopkar and Mr. Anup Singh Batla. His work in the film “Rasikpriya” won him the national award for best cinematography in the non-fiction category for the year 2000. 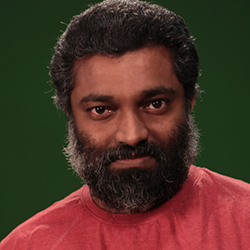 He has been involved in productions for BBC and Discovery Channel India. Presently he is working at FTII, Pune as Professor (Cinematography). Siddharth Shasta is a graduate from Hindu College (University of Delhi) and an alumnus of Film and Television Institute of India (FTII), Pune. His passion for teaching acting is no less. He has worked extensively with schools, institutions and NGO's to cultivate the need of film/ theatre knowledge for people at multiple levels – childhood, youth, adult and Mature. He has also developed and conducted a special programme for the students of National School of Drama(NSD), New Delhi and other theatre students, acting workshopsacross India under the banner of SKIFT, FTII. Presently Siddharth Shasta is designated as Professor and Head of the Screen Acting Department at FTII. 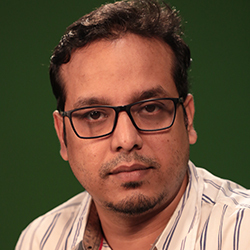 Tuhinabha majumdar studied 3 year PG Diploma in film making from SRFTI, kolkata His film aamaar katha: story of binodini has received two rajat kamal for the best biographical and historical reconstruction film and best cinematography (non-fiction) in the 62nd National Film Awards, 2014. He has also received golden conch for the best fiction film and the best film of the festival award in MIFF, 2012 for ‘Midnight Bioscope’ and the silver award at the 11th Indian documentary producers’ award for excellence in 2015 for the documentary ‘City within the City’. 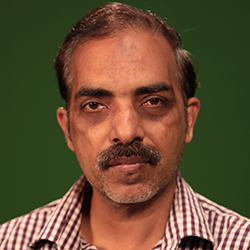 He also has worked as programming head in television channels in kolkata. 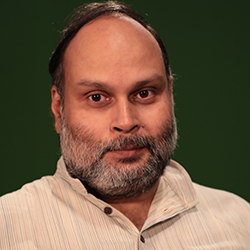 He has conducted film making workshops at SRFTI, Kolkata, Allahabad university, Jadavpur university, Kolkata etc. 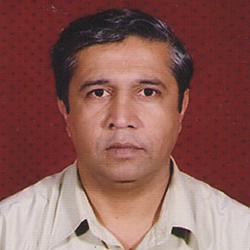 He has been working as a writer, editor and director in films and television for last twenty years. Holds 'Bsc in Physics’ from Calicut University and Postgraduate Diploma in ‘Sound Recording and Sound Engineering’ from FTII, Pune in 1991. 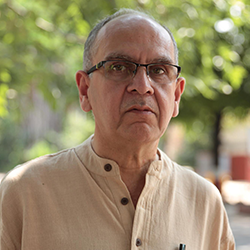 He has worked with Mani Kaul as his Chief Assistant Director in the films ‘The Cloud Door, The Servant’s Shirt, Light Apparel and Bhoj, during 1992 to 1999. As a sound designer, he has worked for the feature films like, Dharaviand Hazarom Kwaish Aise by Sudhir Mishra, Throne of Death, Wart (Co-Writer of the film), The Dogs Day, Unni, and Virgin Goat by Murali Nair, Ek Hasina Thi, Johnny Gaddar, Agent Vinod and Badlapur by Sriram Raghavan. And many more.He was also associate with Documentaries as a Sound designer. He has been closely associated with the Dhrupad Gurukul as a student and a Sound Engineer for most of the Gurukul programs. 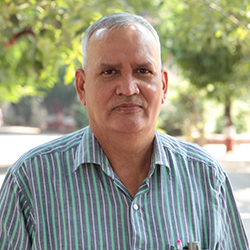 Mr. Tiwari has completed his Masters degree in ancient Indian History & Archaeology from Kumaon University Nainital. FTII Diploma in Cinematography 1996. He has professional industry experience of 14 years in Film s and Television as well. As a Faculty, He has taught in various film workshops for five years before joining FTII in 2012. Presently he is working at FTII, Pune as Associate Professor, Cinematography. Shri. Rath, after graduation in Physics from Sonapur College, Odisha had joined Film and Television Institute of India, Pune for P.G. Diploma in Cinematography. After completion, since 1991, he is associated as cinematographer for various Feature films, Advertising films and Documentaries. As a speciality, he has done several projects as stop motion photographer including title sequence of ‘Tare Jameen Par’. 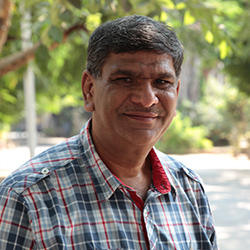 With professional experience of around 25 years, he has joined FTII as Associate Professor in 2016. 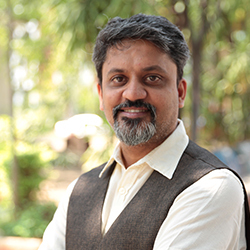 His professional journey in films and electronic medium of mass communication started in the year 1998 after successfully graduating from Film and Television Institute of India, Pune with specialization in Art Direction. 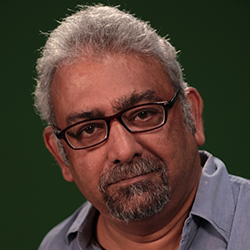 With key areas of operation in the field of Visual Designing, Art Direction, Motion Graphics and Show Packaging for well over 250 TVC Films, 400+ Corporate Films, DD News and HomeShop18, He hasbeen involved in conceptualization and storyboarding through the creative processing, planning, scheduling, budgeting and meeting pre and post requirements, along with maintaining creative and logistical protocols and deadlines. He joined FTII as Associate Professor in 2018. 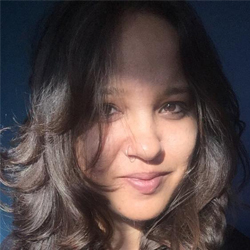 Alka Singh is a filmmaker, editor and producer. She studied film direction at Satyajit Ray Film and TV Institute, Kolkata, and spent a year in Paris studying editing at École Internationale de Création Audiovisuelle et de Réalisation. Among others, she edited and co-produced with NHK Japan, a feature documentary about comics subcultures in Tokyo,‘The Fragile Heart of Moé (2010). Most recently, she self-produced a documentary Rome was not built in a Day (2016). Currently based in Pune, she has taught Direction and Screenplay writing at MIT Art, Design and Technology University and is working on a feature documentary. 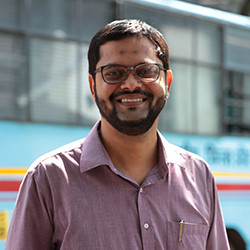 He is honoured with MSc in Applied Geology from Jadavpur University, Kolkata, Post Graduate Diploma in Cinema with Specialization in Editing from Satyajit Ray Film and Television Institute, Kolkata, Masters level course in Cultural Studies from Centre for the Study of Culture and Society, Bangalore. He also has Directed video work published under special curator-ship from Lowave, Paris. 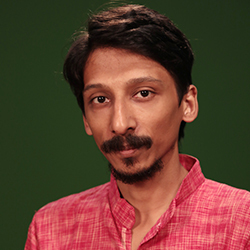 He has researched, directed and edited six 30 minute documentary episodes on Bengali culture and literature. They have been shown in various international festivals and received international and national level awards. 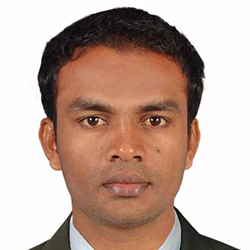 Currently, he is pursuing Ph.D. from International Institute of Information and Technology, Hyderabad. Suchitra Sathe is a graduate of the Film and Television Institute of India (FTII) where she specialised in Film Editing. 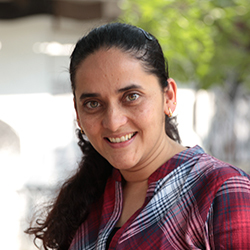 She also holds a Masters Degree in Communication Studies from Pune University. Her Diploma film on which she worked as an editor, won the prestigious Silver Bear for Best Short Film at the 2008 Berlin International Film Festival and National Award for Best Short Fiction Film in 2008. She has edited over 16 feature films, several documentaries and short films. Some of her work includes National Award winning films such as Gabhricha Paus (The Damned Rain), Ringan (The Quest) and Dhappa (Howzzat). She has edited critically acclaimed films like CRD and commercial successes like Time Please, Baapjanma and Gulabjaam among others. She is teaching in the TV wing of FTII since 2015. Studied film direction at the FTII and holds a master’s degree in communication studies from Pune University. Hisdocumentary film Voices across the Oceans, was awarded the Golden Lotus for Best Direction at the 53rd National Film Awards in 2005. Also, Traveling in a Cage, a portrait of renowned poet-artist Dilip Chitre, received a special mention award at the 12th UGC-CEC Annual Video Competition in 2000. 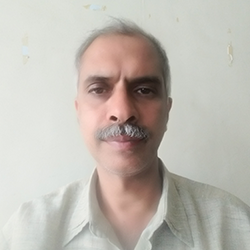 His Hindi translation of selected Marathi poems of Dilip Chitre titled 'Barf ke Din' AKA ' Days of Snow' has been published in the journal of Hindi literature, Samās, in 2017. Before joining FTII as a faculty, he has taught filmmaking and film appreciation at Pune University and Tilak Maharashtra University, Pune. Holds Post Graduate Diploma in editing , FTII Pune. Holds Post Graduate Diploma in editing , FTII Pune.His final year Diploma film as an editor, ‘Girani’ won National Award. He Edited “YETI” in 2014, was selected in Torino International Film Festival, ITALY. As a professional editor, he has edited documentary films for Discovery Channel. Has completed a Diploma in printing technology, and done AMSP & AT of Maya from Arena Multimedia and in 3D Modelling & Animation from Digital Asia School of Animation, Bangkok. He joined FTII in 2014. 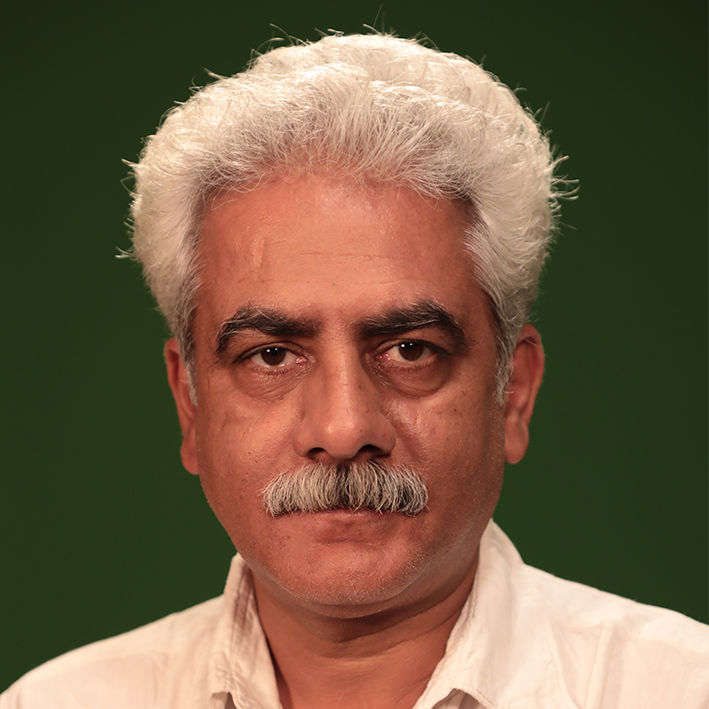 Soumil Shukla is a pass out of the Screenplay writing Department at the Film and Television Institute of India (FTII), Pune. 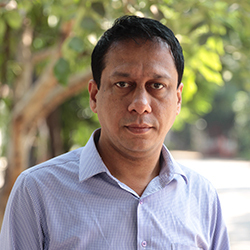 Having written as a social science researcher at Network18, he has also worked in television and has been teaching screenwriting over the years in Mumbai. He holds the prestigious New Voices Screen writing Fellowship award organizedby the Asia Society and Time Warner Inc.